April is here and I have two scheduled appearances this month. The first one is the Great Philadelphia Comic Con, April 12-14, at the Greater Philadelphia Expo Center, 100 Station Avenue, Oaks, PA. If you go to the convention’s website, it lists over two dozen comics industry guests, including Neal Adams, Don McGregor and Larry Hama. It also lists over three dozen media guests, including John Wesley Shipp, Alice Cooper and Rose McIver. Plus cosplay, gaming, and much more. It looks to be a spectacular event, made even more so because my Saintly Wife Barb will be attending with me. Best of all, there is no added admission price to see the world’s most patient woman, a wonderful person who has been married to me for just short of 35 years without strangling me. Man and Superman 100-Page Super Spectacular by Marv Wolfman with artist Claudio Castellini [DC Comics; $9.99] is the best Superman story I’ve read in decades. 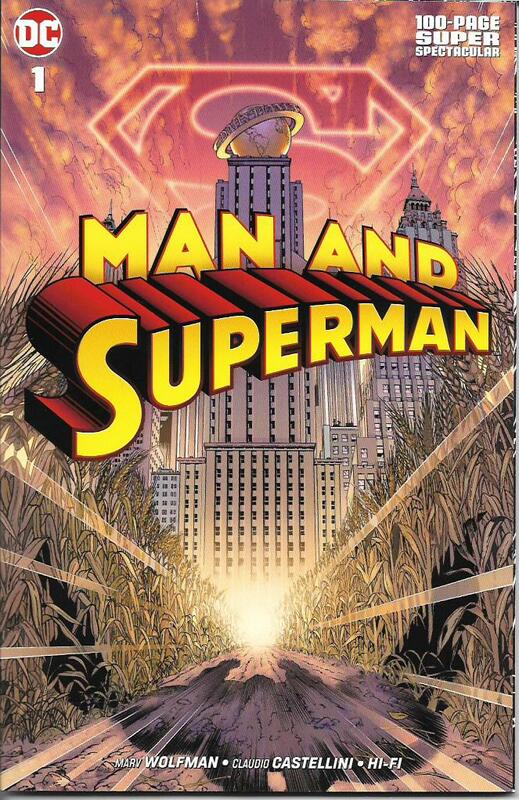 Originally written over ten years ago for the defunct Superman Confidential title, it’s an epic retelling of Clark Kent’s first weeks in Metropolis. I don’t use the term “epic” lightly. While Man and Superman might not have a cosmic catastrophe at its core – and I’m so very weary of those from both DC and Marvel – it gives us a super-hero who has justifiable doubts about his dual roles in the world, who overcomes those doubts and emerges as the hero who will soon become known as the world’s greatest super-hero. It’s an incredible Superman story, one that doesn’t rely on dozens of other heroes, that doesn’t need to crossover with twenty other issues. It stands alone. Few things would be make me happier with DC and Marvel comic books that more adventures like this one. Wolfman’s writing is some of his best. I’d compare it to his run on Tomb of Dracula or the first years of The New Teen Titans. Yes, he is a dear friend of mine, but he knows as well as anyone that does not influence my reviews in the slightest. He’s as good as he ever was, which says a lot for a fifty-plus-year career. Castellini’s art is eye-catching where it needs to be and down to earth for the human drama. The color art by Hi-Fi works with the story and art, never overwhelming it. The Tom Orzechowski lettering is right up there as well. Yes, Tom is also a dear pal and someone I hired when I was a Marvel editor. I have a lot of friends in this business. Thankfully, most of them are amazing at what they do. It keeps our too-rare meetings from becoming awkward. Man and Superman is my pick of the week in a competitive week. It’s rated “T” for teen, but I’d have no problem giving it to a younger reader. It’s a terrific comic book. NOTE: Before anyone sees a slight where there is none, I have not yet read the various Superman comic books written by Brian Michael Bendis. I plan on binge-reading them this summer. I’m not kidding when I say I’m increasingly bored by cosmic battles and crossover overload. 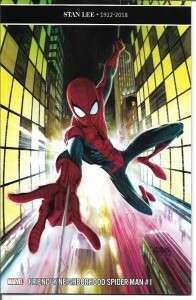 What won me over to this new Spidey title is that, even with some fairly odd goings-on, it has the feel of a down-to-earth super-hero title. Written by Tom Taylor, whose efforts on DC’s Injustice and Marvel’s All-New Wolverine were first-rate, the title gives me a Spidey and a Peter Parker to whom I can relate. In both identities, our man is a good neighbor. His day-to-day civilian problems aren’t over the top, at least not for the Marvel Universe. I mean, I’m not sure why he has Boomerang for a roommate, given that said villain has been a cold-blooded assassin for pretty much his entire comics history, but I’ll give Taylor some rope here. Artist Juann Cabal’s provides some lively visuals throughout these issues. Despite having seen a great many double-page shots of Spidey swinging among the skyscrapers, I was very impressed by Cabal’s version of that well-worn image. Kudos also to color artist Nolan Woodward and letterer Travis Lanham. The basic fun atmosphere of the book still allows for some fairly heavy human drama. A back-up story in the first issue – with art by penciller Marcelo Ferreira, inker Roberto Poggi, color artist Jim Campbell, and letterer Lanham – promises some difficult times for Peter and a beloved supporting character. Let’s call Friendly Neighborhood Spider-Man “my” Spider-Man comic for now. I’m looking forward to future issues. Ian Boothby is one of my favorite comics writers. He was the best of the Simpsons Comics writers at Bongo Comics. He’s done some fine and funny work for MAD. Not enough comics afficinados know his name and they should. All of which brings us to Exorsisters #1-5 [Image; $3.99 each] with excellent art by Gisele Lagace; great color art by Pete Pantazis of Black Lightning: Cold Dead Hands fame; and solid lettering by Taylor Esposito. The title stars are Cate and Kate Harrow. Their mother is a piece of work who dragged them into her deals with the devil. Their job is to be pains in the buttocks to said devil and others of his ilk. I don’t want to reveal more because there are many cool surprises in these issues. Boothby brings a lot of character to the young ladies. He combines supernatural suspense with considerable humor. Lagrace is more than up to providing the visuals. I’ve loved her work since the moment I saw it. Someday, short of making a deal with the devil, I’d love to work with her. 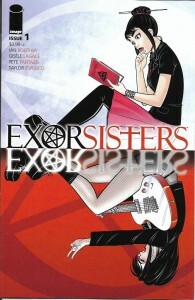 Exorsisters Volume 1: Damned if You Don’t [$16.99] will be hitting the comics shops any day now. It’s rated T+ for teen plus because it’s got that supernatural element in it. If there’s a down side to this volume, it’s that it ends on a cliffhanger. But, that aside, it does deliver a big chunk of satisfying story. I recommend it to teen and older readers. The second of my April appearances is a Coffee and Comics workshop in conjunction with the Ohio Center for the Book and the Cleveland Public Library. It happens on Saturday, April 27, 10:00-11:30 am at the Rising Star Coffee Roastery, 3617 Walton Avenue in Cleveland, Ohio. I’ll be discussing comics storytelling with a few surprises for the “class.” I’ll have more information on this event in next week’s column. See you then.